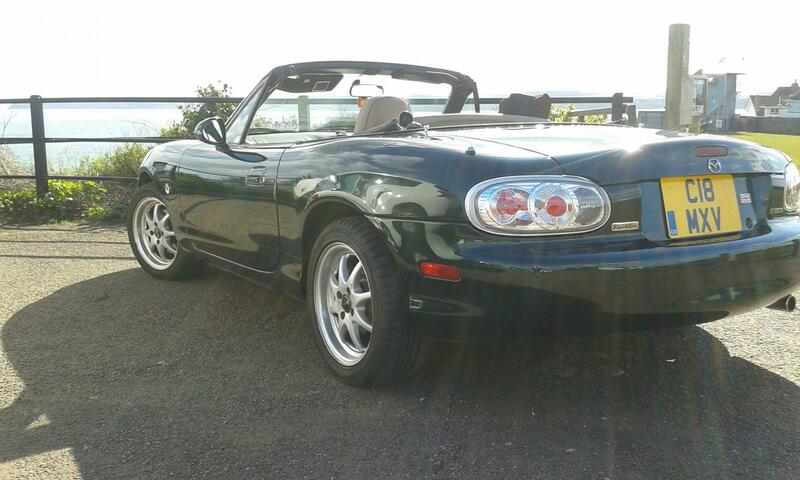 Mazda MX5 auto, 1.8 NB. Now sold pending funds. 'V' spec, Eunos import, 1998 imported 2007 with 85000 kms on the clock. Clock was converted then to miles and has since done another 25000 miles (total about 75000 miles). Was fully rustproofed when imported, even inside the doors as well as all the chassis rails, it's really good underneath (MOT man was most complimentary about the condition) but it had a new drivers side wing panel fitted at this time which has gone rusty right underneath but the sill (cill) underneath is perfect! It has: PAS, ABS, airbags, electric windows, leather, alarm/remote central locking, new stereo, woodrim steering wheel, mohair hood (nice order, no rips or tears or wear) and aftermarket alloys, windblocker. 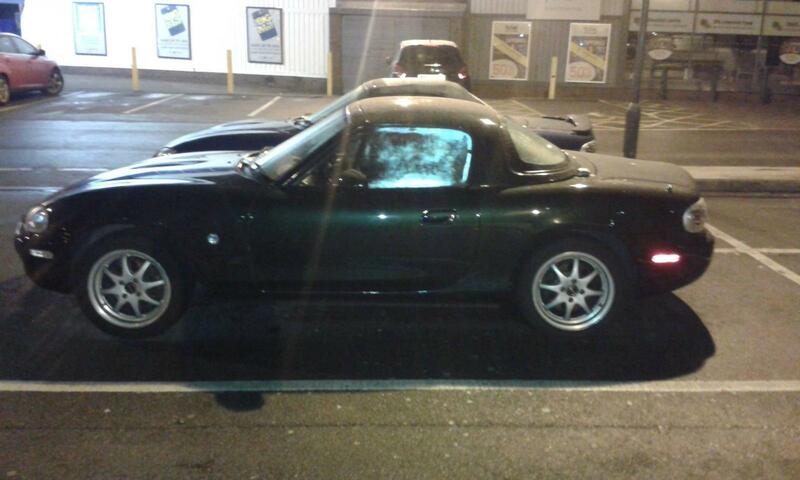 Hardtop (slightly different shade though same code). It had new shocks and springs, discs and pads, leads and plugs, exhaust and cat, new cambelt, engine, gearbox and diff serviced last year (and just been serviced again) and all the tyres are good with loads of tread. They are cheap and nasty ones but grip well and seem fine to me. It is MOT'd until this time next year. 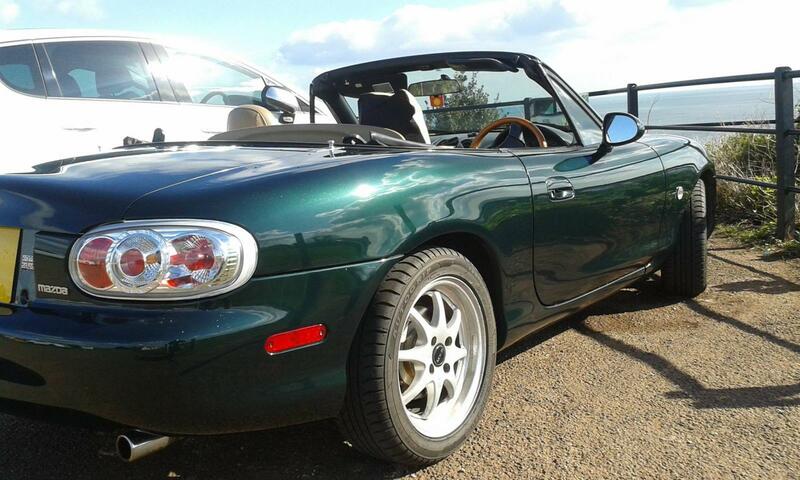 Bodywork is great, no rust, dents, scratches or nastys and is in 'Grace green metallic'. 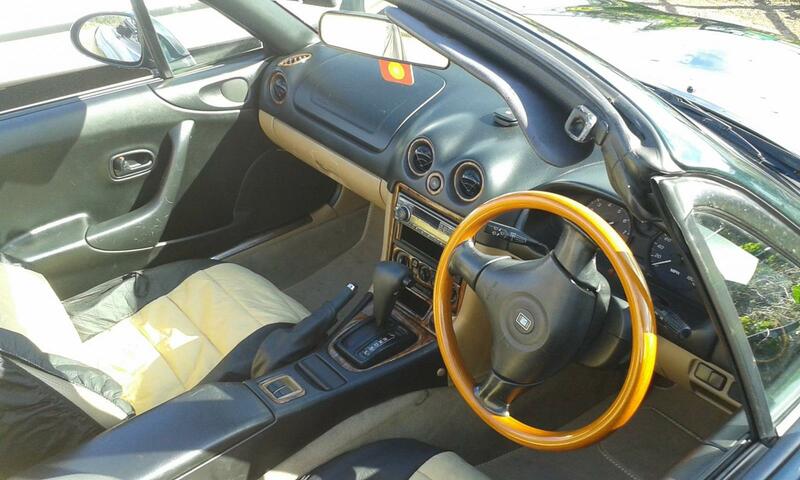 Interior is beige/cream leather, drivers seat was worn and cracked but got re-coloured (slightly wrong colour!) so looks fine, no rips or tears though. Carpets are spot on, passenger side of the dashboard has scratches from the previous owners dog (no, mine are not to blame!). The car is water tight, never leaks! it drives perfectly, brakes are great, engine is a most sprightly little lump with no nasty noises, gearbox is A1 and the hold feature works as it should. Oh, and the ABS works as I found out in the snow! I really like this car so a bit unsure about selling it, but it's not practical for me really with two dogs, so if it sells, then all good, if it doesn't, then equally, all good! There are not many NBs around in rust free condition (apart from the bit mentioned) and with so much recent work done so it ain't cheap, but worth it. I've not long sold a 2001 Mk2.5 1.8 Sport that wasn't half as good as this sounds for £1300. This sounds like a good deal. Prices are a bit all over the place. This is the sort of car dealer would want £2500 for easy. I forgot, I've also painted the discs and calipers silver so they are all pretty. I hope it was with the stress of the wallet trying to get out! Will it go on classic insurance? 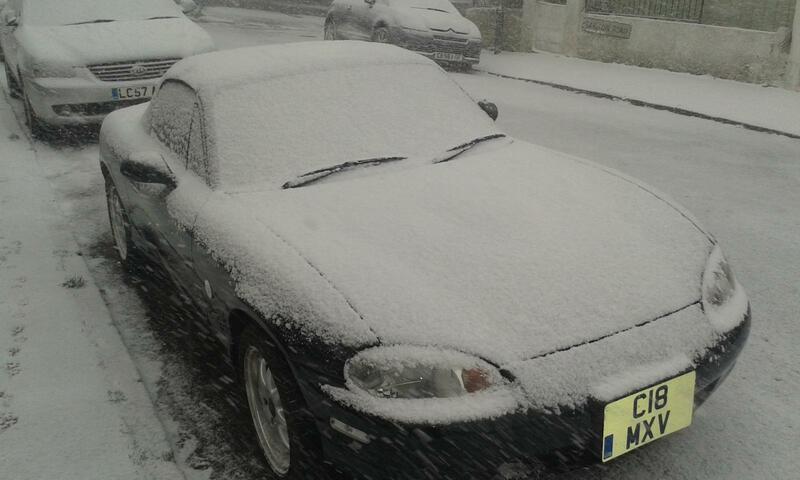 I have never seen an Automatic MX5 before! Didn’t even. GLWS! Sure will, with my current insurer, £112 fully comp per year! On the Mk1 and Mk2 models, automatic was only available on JDM (Eunos) models AFAIK - and even then, the majority of imported cars are manual so you don't see many autos around. WTF can I sell to buy this. Anyone fancy a Hyundai i10 2011 plate. 1.2 auto. Get a handle on yourself for half an hour man. Step AWAY from from the SALES/WANTS. My wife says if I clear the garage out I can have it. Better get cracking then! I forgot to mention, there are STANDARD rear lights, spare front lights and a few other bits and bobs to go with it. Not sure if the standard lights retain the foglicht though, never looked! Umm... Aren't you going to be a bit stuck if you sell this, the Kia and the Dollop? The thought had occured to me! But, the chances of all three going at the same time must be one in a million (you watch...) so there should be one car floating around. Ill have £5 on them all selling on the same day please. Bump you tight arsed buggers! Get it sodding bought, I will even throw in a hair dryer and a brush! Can't say fairer than that now can I? Oh, and I washed her again today, so all clean and shiny, If someone doesn't cough up soon, I will have to put fuel in it again! I do quite fancy one of these, but at the moment I need an estate. Sorry dude, you can have a free bump though! /\ Haven't you got a fukked MGF to collect/sort? 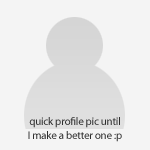 Well maybe one can but I haven't gotten that far yet. My garage clearing mission starts tomorrow. I'm so serious about this I'm going to get to Tesco on the way home to get storage boxes, and I'm going to get up at 6am and start cracking on. There's A and X in Vauxhall!!!! I absolutely want it, but me getting it is contingent on me clearing the garage. If I've finished the weekend with a clear garage I will be able to say 100% yes I will have it.